THE GOOD - The performance by Joaquin Phoenix and the artistic directorial choices by Lynne Ramsay. THE BAD - The film is light on plot and similar to stories we have seen before. 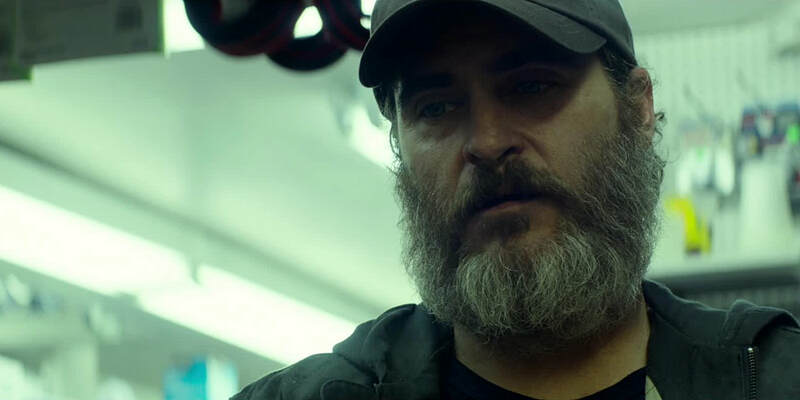 ​​​​​Joe (Joaquin Phoenix) is a veteran and a loner who performs brutal hits to protect and recover missing teenage girls. We quickly come to understand him as a complex and haunted individual, who outside of his profession, is also prone to self-inflicted violence and suicidal obsession. Our first introduction to his humanity is in the relationship he shares with his aging mother, whom he lives with and cares for. Judith Roberts is well cast and the connection between the two characters is the best in a film that is as brutal as it is. When his employer calls upon him for help with a high profile missing girl case, he successfully executes on the expectations, unaware of the series of events that his involvement would set in motion. He makes a connection to the victim of the crime that leads him on a path of unexpected vengeance and self-discovery. As we uncover the gruesomeness of what he is working to protect, we slowly learn the details of his own connection to violence that also started at a young age. Scottish filmmaker, Lynne Ramsay (“We Need To Talk About Kevin”) makes some very smart directorial choices to balance the film by amplifying the violence when appropriate, but distancing the audience when reprieve is needed. As an example, there is a very uncomfortable scene where we are exposed to the full nature of the crimes that our anti-hero is avenging and Ramsay chooses to show this pain and violence through the lens of security footage. It provides appropriate space from the heinous acts of these men and the intensity of the violence that Joe uses to deal with them, which (Much like another similar film: "Drive") involves a hammer. That said, this film does not shy away from violence and in other moments it is front and center and painfully felt in the sound editing and also the anguish of the central character. Joaquin Phoenix completely disappears in this role providing us with some of his best work yet. With very little dialogue, the weight of his past and his personal connection to violence is a visceral experience that is captivating to watch when in the hands of such a capable actor. Although it is not challenging to anticipate his next moves, the torment through which his character is experiencing is mesmerizing to watch. As mentioned before, there are moments within the screenplay that are very predictable, but luckily are made effective by the choices made by Phoenix and Ramsay. The story of bad and powerful men, praying on the innocent and meeting their match in an unexpected hero, has been done before. The adaptation of Jonathan Ames’ novel is certainly effective in balancing the style of filmmaking that Ramsay brings to the table and it is clear to see she was heavily involved with the author on that adaptation process to achieve the right balance for this film. However, the third act does manage to surprise in a few turns near the end of the film. After this film’s amazing success at the Cannes Film Festival with wins in Best Actor for Joaquin Phoenix and Best Screenplay for Lynne Ramsay, the Next Best Picture team was excited to get an early preview of the film at this year's Sundance Film Festival. It is scheduled for wide release in February of 2018 and just missed eligibility for this year’s award season. Whatever the next steps are for Amazon in campaigning this film for future awards potential, I can only hope to see it get the “Manchester By The Sea” treatment. That treatment should primarily be on behalf of Joaquin Phoenix and writer/director Lynne Ramsay. Her direction for this film was inspired and unique. Couple that with an amazing lead performance and her sharp script adaption and you have a successful story of a troubled vigilante, who crawls his way back from obscurity. The year is just beginning, but Joaquin’s performance deserves early consideration in next year's awards conversation.